If you have a PayPal account (either a personal or a business account), you can connect this to Gift Up! and we will take payments using your PayPal account. You get the full gift card revenue deposited into your PayPal account immediately. We then collect our 3.49% fee in a monthly invoice we issue to you. 2) Log into your PayPal account and Grant Permission to Gift Up! We only ask for access to your PayPal account email address. We cannot access funds with the permissions of our connection, by design. 3) After this you should be connected! Any gift card sale revenues will be deposited straight into your PayPal account. 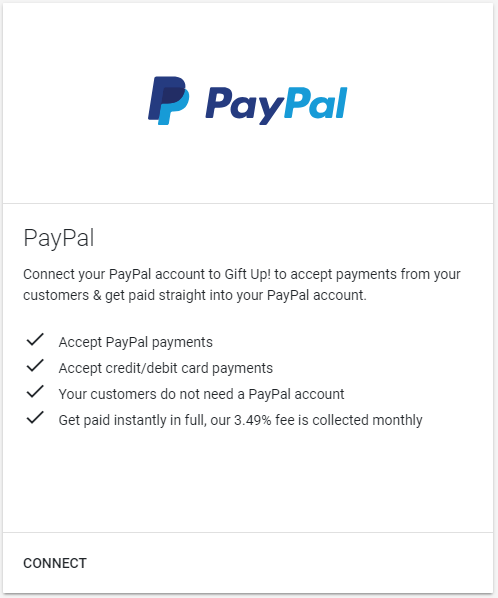 What if my customers do not have a PayPal account? How can they pay? With our PayPal integration we allow your customers to pay without a PayPal account and with their card instead. But as PayPal control these buttons, their actions and how they look, we have no control over them. It is not obvious that a customer who does not have a PayPal account needs to click the card icons instead.